* These Images are provided for informational purposes only. You are purchasing the item as specified by the Manufacturer Part Number stated in the description regardless of any images or other information contained in this listing. Item Description - Brand New In The Box! *Teckwave is not responsible for errors, omissions, or compatibility issues based on this information. 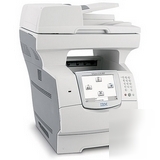 The IBM Infoprint 1570 MFP is a high-performance departmental monochrome print, copy and scan device. A single multifunction device can replace multiple single-function devices to lower your total cost of printing and provide the functionality required by an On Demand Business. * We use whichever carrier is best for each delivery. * Orders from Hawaii, Puerto Rico, Canada, and Alaska. * All merchandise found to be defective can only be exchanged for the same item. You must contact seller for Return Authorization number.